Saltwater crocodiles are the biggest reptiles in the world. They can grow up to 6.17 meters (20 feet 3 in) and can weigh more than a ton. Measured at 20 ft 3 in (6.17 m), and weighed 2,370 lbs (1,075 kg), Lolong was the biggest crocodile ever measured. He died in captivity at around 8 pm on 10 February 2013, due to pneumonia and cardiac arrest, which was aggravated by a fungus infection and stress. The smallest extant crocodile is the dwarf crocodile (Osteolaemus tetraspis), with a medium adult length of 1.5 m (4.9 ft). Maximum recorded length for this species is 1.9 m (6.2 ft). They can be found in all inhabited continents with the exception of Europe. Despite being classified as “reptiles”, crocodiles (and all crocodilians, including alligators) are more closely related to dinosaurs and birds (which are actually avian dinosaurs) than to most animals classified as reptiles. Crocodiles really do produce tears. Because, while eating, they swallow too much air, which gets in touch with lachrymal glands (glands that produce tears) and forces tears to flow. But it’s not actually crying. The term “Crocodile tears” (and equivalents in many other languages) refers to a false, insincere display of emotion, such as a hypocrite crying fake tears of grief. It is derived from an ancient anecdote that crocodiles weep in order to lure their prey, or that they cry for the victims they are eating, first told in the Bibliotheca by Photios I, who was the Ecumenical Patriarch of Constantinople. This tale was first spread widely in English in the stories of the Travels of Sir John Mandeville in the 14th century and appears in several of William Shakespeare’s plays. Crocodiles have a valve at the back of their throat allowing them to open their jaw underwater. They have an average lifespan of at least 30-40 years and in the case of larger species an average of 60-70 years. There are claims of some individuals exceeding 100 years, but there is no strong evidence to support that. The first crocodiles appeared around 250 million years ago, at the same time when dinosaurs appeared. The prehistoric ancestors of crocodiles were much bigger than today’s counterparts. Sarcosuchus skull next to a human. Sarcosuchus, popularly known as “supercroc” is an extinct genus of crocodyliform and distant relative of the crocodile that lived 112 million years ago. It dates from the early Cretaceous Period of what is now Africa and South America and is one of the largest crocodile-like reptiles that ever lived. It was almost twice as long as the modern saltwater crocodile and weighed up to 8 tonnes. Like most crocodiles, it had a huge biteforce, possibly up to 9 tons, more than 88,000 N, far exceeding any modern-day crocodile (16,460 N). Crocodiles have the strongest bite ever measured. 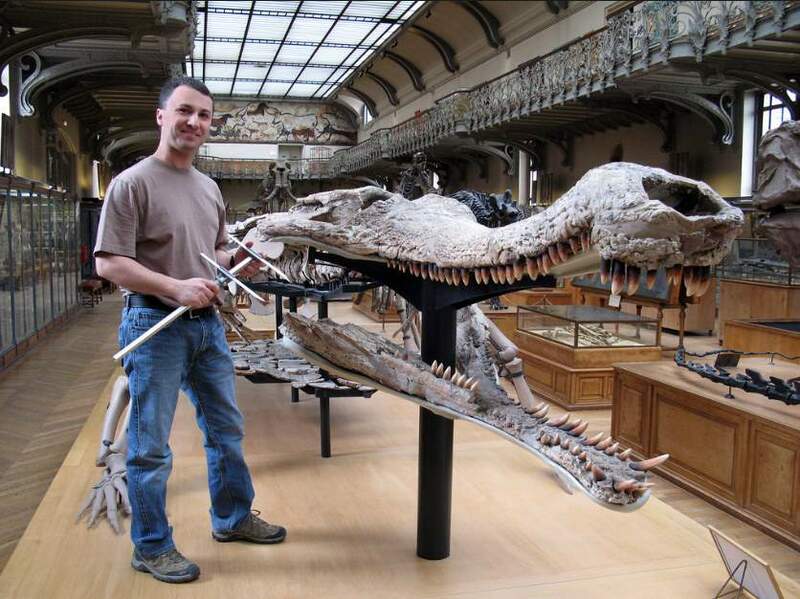 Paleobiologist Gregory M. Erickson and colleagues tested the bite forces of all 23 living crocodilian species. The strongest, saltwater crocodiles (naturally) slammed their jaws shut with 3,700 pounds per square inch (psi), or 16,460 Newtons, of bite force. For a comparison, a lion has a bite force of 1,314.7 Newtons at the canine tips and 2,023.7 Newtons at the carnassials. 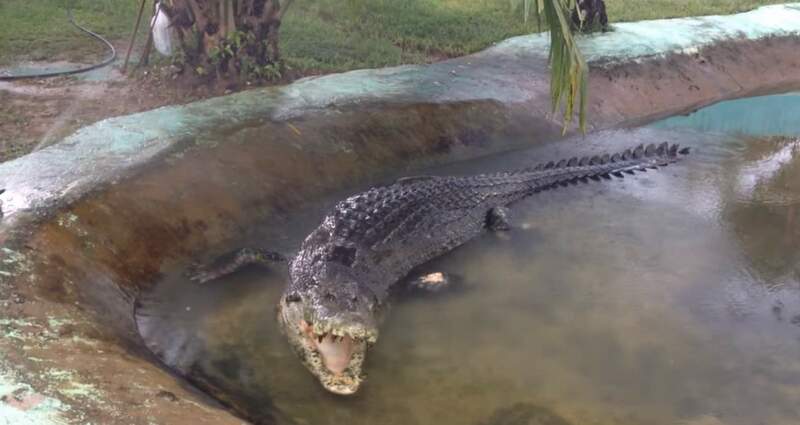 But, despite this enormous bite force, their muscles to open the jaw are extremely small and weak that a human can use her/his bare hands to keep a crocodile’s mouth closed. Their night vision is very good and they are mostly nocturnal hunters. Crocodiles have the most sophisticated heart in the animal kingdom, and actively change the destination of blood that flows through it depending on requirements. Crocodiles carry their babies to the water in their mouth. Baby crocodiles can make noises from inside their eggs before they hatch. The mother can hear their voices, then digs up the eggs from the sand, and takes the hatchlings to the water. Their top swimming speed is 15 km/h (9.3 mph). Crocodiles have webbed feet which, though not used to propel them through the water (they tuck their feet to the side while swimming and use the power of their tails), allow them to make fast turns and sudden moves in the water or initiate swimming. Like other reptiles, crocodiles are cold-blooded. So, they have a very slow metabolism, which allows them to survive long periods without food. They can survive many months on a single large meal. Crocodiles do not have sweat glands and release heat through their mouths. They often sleep with their mouths open. They do not chew their food. Many large crocodilians swallow stones, which may act as ballast to balance their bodies or assist in crushing food, similar to grit ingested by birds. Most of the young crocodiles (some sources gives a percent as high as 99%) are eaten in their first year of life – by other predators like lizards, other crocodiles, hyenas, and even fish. They are amphibious reptiles, spending part of their time in water and part on land. Although the saltwater crocodile and the American crocodile are able to swim out to sea, no living species of crocodilian can be considered truly marine. After the crocodile facts, here are the misconceptions about crocodiles. Contrary to the common myth, crocodile skin (and also alligator skin) is not bulletproof. “You can not outrun a crocodile. They can run as fast as a racehorse.” This is absolutely wrong. A racehorse can run faster than 40 mph (64 km/h) with a record top speed of 43.97 mph (70.76 km/h). Crocs cannot get anywhere near that fast on land. Their maximum speed is 12 mph (19 km/h) on land, and for a very short distance (around 20-25 meters), when they “belly run”. They usually go much slower than that. While walking on their legs, which is called the “high walk”, their top speed is only 5 km/h (3 mph). So, an average healthy human can easily outrun a crocodile. They do, however, accelerate very fast, thundering from 0 to 15 km/h in no time, both while swimming and running. 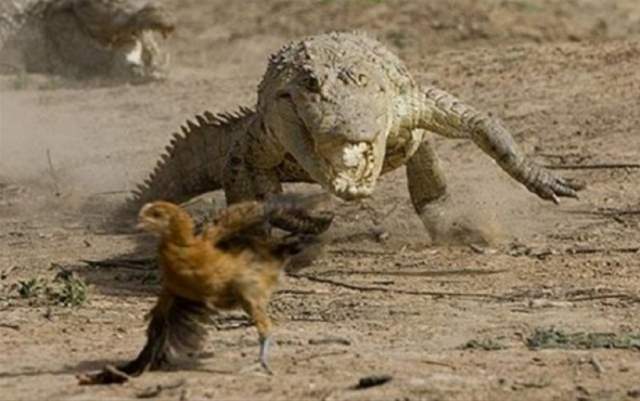 “Galloping” crocodile, in fast running pace, goes after a chicken. The typical maximum speed of a crocodile is 12 mph (19 km/h) on land, and for a very short distance (around 20-25 meters). They do, however, accelerate very fast, thundering from 0 to 15 km/h in no time, both while swimming and running. Egyptian plover, also known as the “crocodile bird” does not clean crocodile’s teeth. No bird clean crocodile teeth. This is a pure myth. The photos showing Egyptian plover cleaning crocodile teeth are fake. Adam Britton, a zoologist and expert in crocodile biology, behavior and conservation at Charles Darwin University, says “Nobody has ever photographed or filmed this, but the myth persists to this day.” This myth actually originated with the ancient Greek philosopher Herodotus (484–c. 425 BC), but no known photographic evidence exists, and the written accounts are considered suspect also by the biologist Thomas Howell. Neither crocodiles nor alligators eat their babies. No crocodilian do that. Evon Hekkala, the principal investigator at Fordham University’s Hekkala Lab and a research associate at the American Museum of Natural History, says “A long time ago, people would observe the crocodiles and alligators digging up nests and having hatchlings in their mouths, and they would think that they were eating them.” In fact, they were taking their babies to the water. See the “crocodile facts #12”. Crocodiles are not dumb. While the brain of a crocodilian is fairly small, it is capable of greater learning than most reptiles.